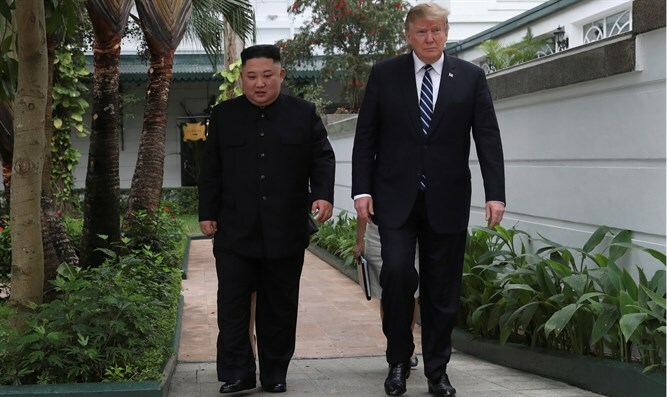 Meeting Trump in Hanoi, Kim Jong Un says he would not have come to summit if he was not prepared for denuclearization of Korean peninsula. North Korean leader Kim Jong Un said on Thursday that he would not have come to Vietnam to meet with US President Donald Trump if he was not prepared to pursue the denuclearization of the Korean peninsula. In answers to reporters’ questions during his meeting with Trump, Kim also said he would welcome the idea of putting a US liaison office in Pyongyang. Trump and Kim were in Hanoi for a second round of talks, after meeting on Wednesday for the second time in eight months. Prior to the second meeting, Trump said he was in "no rush" to secure a deal over Pyongyang's nuclear program. He added that "speed was not that important" to him as long as the North's pause in missile and nuclear testing continued. "I can't speak necessarily for today, but I can say that this, a little bit longer-term, and over a period of time, I know we're going to have a fantastic success with respect to Chairman Kim and North Korea," said Trump, according to AFP. Trump and Kim held their first historic summit in Singapore last June, during which they signed an agreement which includes a commitment to achieve total denuclearization of Korea, with promises to pursue “vigorous negotiations” to that end. However, the negotiations have stalled, with reports suggesting that despite its commitment to denuclearize, North Korea has continued to expand infrastructure at nuclear and missile sites. US officials have downplayed expectations for the second meeting, and Trump has made clear he does not expect it to be his last with Kim. Last week, US officials said Trump is expected to ask Kim to give up all of the North’s nuclear weapons.